In January 2017, I listened to an interview with UC Berkeley sociologist Arlie Russell Hochschild on National Public Radio about her New York Times bestseller. But it was not until a friend of mine recommended Strangers in Their Own Land that I actually read it. My friend commended the book less for a more informed understanding of the rise of the Tea Party and – by implication Trump – but rather for providing an empathetic, humane perspective of the supporters of the American conservative party, especially its populist right wing. By focusing on the environment, Hochschild elucidates the emotional experience behind the unprecedented split of America’s political camps, more specifically, of those voters that the Tea Party movement has so successfully mobilized in the last election. This “deep story,” as Hochschild calls it, is not genuine to Tea Party voters alone. Neither does having a “deep story” mean that members of one political camp share the same experience. According to Hochschild, however, there is a significant overlap regarding major arguments, values, and implicit assumptions that make up these felt experiences. Often, these have little, if nothing, to do with facts and are, instead, contradictory, heartfelt matters. The author finds that the “deep story” of red states, such as Louisiana – the state in which she conducted her interviews – runs along the following lines: Despite years and years of hard work, patient and orderly ‘waiting in line,’ and great personal sacrifice, the rewards promised by the government were bypassing people, especially older white male blue-collar workers. For decades, they had been patiently waiting for a rise in their paychecks and better life opportunities. They now feel that others (such as blacks, women, and immigrants) are cutting in line and receiving rewards without either the same work performance or the same patient and orderly conduct. As a result, the majority of white Louisianans has lost trust in the government and now turns to either corporate businesses or their private circles, including church communities. Furthermore, acutely aware of liberal perceptions of them as backwards, uneducated, homophobic, racist, and sexist, white Southern men and women feel not only misrepresented but also deeply humiliated. It is this sense of being treated unfairly and openly shamed that leads them to feeling like strangers in their own land. Hochschild divides her book into four parts, each of which unfolds through the stories of individual residents – white men and women – in Lake Charles, Louisiana. “Part One: The Great Paradox” explains the contradictory fact that states like Louisiana – with low economic, health, educational, and environmental standards – object to the help and regulation by the federal government and, instead, open their doors to big international corporations. This policy, Hochschild maintains, will inevitably result in the severe exploitation of the state, its residents, resources, and environment. “Part Two: The Social Terrain” sounds out the relationships between state and federal politics, business, and the individual workers. Here, all stories embrace a free-market and small government atmosphere as well as the notion that less governmental support equals a higher social standing. While individuals and the state of Louisiana are seen as honorable due to their endurance in the face of continuing recession and environmental pollution, governmental support becomes tantamount to the handing out of favors in a culture of victimization that originated in the social turmoil of the 1960s. Hochschild’s interviewees unanimously refuse to be victims. “Part Three: The Deep Story and the People in It” translates the implicit factors and tacit assumptions of Part Two into a more streamlined and perhaps simplified version of the “deep story” of the right while at the same time illuminating the actual contexts, namely the dire economic situation, class conflicts, and systemic racism and sexism. In the parlance and ideology of the conservatives, however, class conflicts are notably absent whereas systemic inequalities are broached in terms of favoritism and welfare – topics often discussed in connection with the decline of morals and values, such as hard work, family values, and codes of honor. 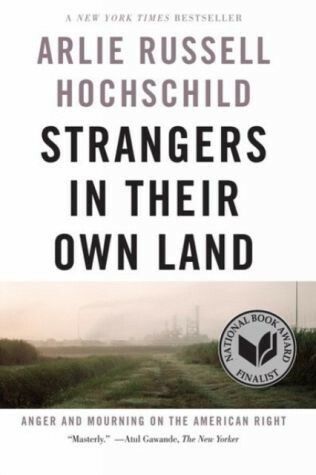 Hochschild’s book certainly acquaints readers with lesser-known perspectives, but is it convincing? For an answer to that question, you’ll have to stay tuned until next week. Until then, why not familiarize yourself with an excerpt.